Where was I? Yes, Robyn’s 68-worder. The other entries I appreciated include “TONE IT DOWN,” newlyweds’ FIRST DANCE beside the often-for-a-wedding SAVE THE DATE notice, EMPTY NESTERS, ABBEY ROAD, AS COLD AS ICE, and NANNY STATE. In her constructor notes, Robyn singles out affix –ARY and plural abbrev SYNS as the junky glue. I’m going to forgive SYNS because its clue was so cute: 22a. [Warm and toasty, e.g. : Abbr.]. December rolls in this weekend, so who (in the Northern Hemisphere) isn’t keen on warm and toasty? 45a. [___ Smetanina, first woman to win 10 Winter Olympic medals], RAISA. Didn’t know the name, but RAISA isn’t an unfamiliar Russian women’s name. She medaled in cross-country skiing from 1976 through 1992. 16d. [Possible reason to forgo mascara], STYE. Great clue. 51d. [Big 12 sch. ], TCU. I had filled in *SU, which made [Employer of some shepherds], CANINE UNIT, very hard to find. 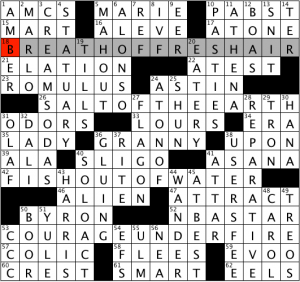 4.25 stars for the Friday puzzle. Whoever constructed the Saturday NYT, I hope you’re saying “Hold my beer” and will bring us a show-stopper. One little kvetch, bubbeleh: I wouldn’t necessarily say that a mensch has cluing equivalency to SALT OF THE EARTH; both indicate trustworthiness and integrity, but salt of the earth, considering the phrase’s origin in the Sermon on the Mount, connotes humility and simplicity as well. Fill-wise this took me a skotch longer than a CHE grid usually does — got hung up on LOURS (which just didn’t look right) and SLIGO crossing FLAGON. The HARRIS who was [43a: Host of both the Tonys and the Primetime Emmys in 2013] would be Mr. Neil Patrick, and [59a: Sautéing shortcut for Rachael Ray? ]: EVOO expands to extra virgin olive oil. Lots of nice Chronicly content otherwise: MAHOUT, ALONSO, BYRON, ATHENA. Ooh. Not a letter addition Friday, but a quasi-rebus! Very exciting! True rebuses are not accepted by the LA Times, but this bends the rules somewhat without breaking them. 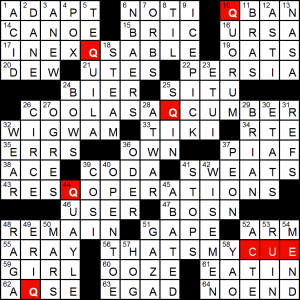 The revealer is the chatty THATSMYCUE, and three long acrosses (plus two shorter answers) have the “cue” sound part of them replaced by the letter Q. In the crossing downs, the Q functions normally. I like that, as it adds a layer of mystery, where correct downs are making seemingly implausible answers across. The whole thing fitted together for a pleasing “aha” moment, the holy grail of crossword themes. [Craft pointed in two directions? ], CANOE . Clue of the week? Definitely a front runner with two days to go! [Rocket launcher], NASA. Simple two word clue, but very elegant. This entry was posted in Daily Puzzles and tagged Dan Margolis, Robyn Weintraub, Ted Nolan. Bookmark the permalink. Yeah, a lot of good cluing. LAT (really liked its gimmick) and CHE are good puzzles as well. Also liked the LAT theme, but have to downgrade due to NBAers and etui. This was the first Fri NYT that I finished “quickly” and Amy’s review didn’t start with something like, “This played more like a Thursday.” I’m counting that as a win! [CHE] Yeah, I filled in the unfamiliar 33A:LOURS and 40A:SLIGO off 27D:FLAGON and 24D:A_TON_OF, then came here to see what they should have been, and was surprised to learn that it was all correct, despite 27D’s OF crossing OF in the theme entry 42A. 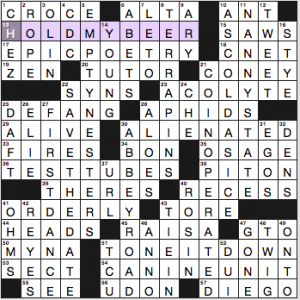 Nice theme, with an ambitious grid (only 73 words with an extra column, roughly equivalent to 70 in a normal 15×15) including two 10-letter downs that cross three theme entries each (3D:CREAM_SODAS is good, though I had no idea what 1A:AMC’s might be; 28D:REPARATIVE, less so, though it’s inferable). It might have benefited from a couple extra blocks in the center, maybe at the ends of 36A:GRANNY — the other alternative is square 24 and its symmetric partner, but that would result in 5-block blobs that people seem to dislike. FLAGON/STIGO/LOURS is a pretty obscure trio, especially the latter two. I absolutely agree that this was a “nice theme, with an ambitious grid…” and I liked the same “Chronicly content” that Laura did. I also agree that those qualities were unfortunately marred by the inclusion of some oddly un-Chronicly variant spellings (LOURS) and obscure trivia, including SLIGO (as clued). The clue for the latter references Benbulbin, which at least has the redeeming feature of being historically evocative for the Irish, if not for most North Americans. Worse, in my view, were the TV trivia trio of clues for ASTIN, HARRIS and, especially, EVOO. I’m just never gonna be happy about a clue that requires familiarity with odd factoids about TV personalities or their programs. I recently discovered the on-line Spelling Bee in the NYT. I wish they would let you play the archives. I’ll bite. What is SYNS short for (22A warm and toasty, e.g.))? I guess I did bite. Thank you. [Homer’s specialty] EPIC POETRY–What’re the odds that this answer would be in two major crosswords in one week? Clued as [Bygone storytelling medium], it was in Anna’s New Yorker on Monday. According to Ginsberg, its only other appearance was in a CrosSynergy in 2012 (author not ID’ed), clued as [Works of Homer, e.g.]. [Activity for newlyweds at a wedding reception] FIRST DANCE = a great entry! 12 million Google hits mostly cite it in the context of Robyn’s clue. However, “First Dance” is a 2009 Justin Bieber song and a 1995 EP by Michael Bublé. “The First Dance” is a 2009 album by Bridezilla.